We fly exclusively with Northern Wilderness Outfitters, headquarters in Fort Frances, Ontario, 140 miles Southwest of Moose Point Lodge. Fort Frances is located directly across the boarder from International Falls, Minnesota which can be reached via Northwest Airlines. If needed, we can easily arrange transportation for you and your group to the airbase. 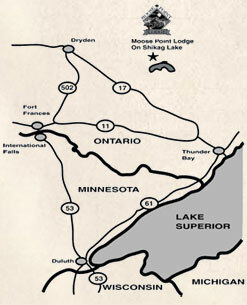 Northern Wilderness Outfitters is located about 8 miles east of Fort Frances on Hwy. 11. 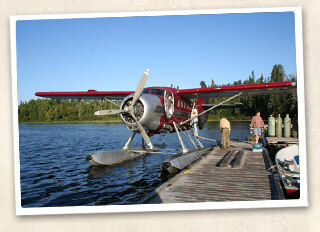 The airbase is just after you cross the Noden Causeway going over part of Rainy Lake on the left side of the road. Their is ample parking at the airbase.Ourflights leave first thing in the morning, about 6:00, so please be prompt. You will arrive at Shikag by about 7:15 a.m., in time for breakfast for American Plan guests. Departure times are between 7:30 a.m. and 8:00 having you back in Fort Frances by 9:30. Please call one week in advan ce for confirmation of flight times. A list of hotels has been provided. I can make hotel reservations for you or if you wish to make your own, please let me know where your staying. If you are flying to International Falls North Air Taxi can pick you up at the airport and take you to your hotel or to the airbase.